I've read, and mostly enjoyed Higgins's Blue Heron quartet, and this one interested me because the description reminded me a bit of Susan Mallery's The Girls of Mischief Bay, which I loved. 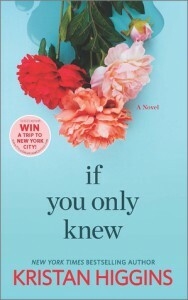 If You Only Knew is a bit of a departure from Higgins's romance - the trademark humor is still there, but as the story progresses you realize it's not a category romance but a story with romantic elements. 1) Divorced Jenny, who forges steadily into a new life with her dress shop but can't break away from her old one. Actually, the people who should be in her past *won't* let go. 2) Married Rachel, who has spent the last decade putting on the front of perfect wife/mother that she misses details like...uh, her husband's womanizing. As these two lives intertwine there are subplots that contribute to the drama and peel away history that impacts the people involved. Family secrets, old emotional wounds, and the ubiquitous back-handed compliments from Mother (seems like there's a mother like this in every Higgins book I've read). But I enjoyed this story, despite my wanting to slap some sense into Jenny and Rachel from time to time. Eventually they figure out what they need on their own, and it's a fascinating journey there.